At Central Periodontics, Dr. Bikram Sethi is an experienced implant dentist. If you’re worried about common issues and complications with dental implants, we can help you understand the entire process of dental implant treatment. In this article, we’ll break down the basics about the dental implant process. We will also discuss complementary procedures like bone grafts and sinus lifts, and discuss some of the common problems that may occur after a dental implant. Read on, and learn more about implant dentistry in Canberra City today! The dental implant process begins with the insertion and placement of the implant itself. Dental implants are placed directly in the gumline by a dental surgeon, in the same position where you had your tooth removed. They function as an artificial “root”. A small incision is made in the gum, and the implant is placed. The screw-shaped titanium rod is placed in the gum, and sutured shut. Over the next 3-6 months, the implant will heal. Titanium has the ability to bond with the surrounding tissue, so the implant will become permanently bonded with the jaw and gum. After this, the implant is ready for the prosthetic. Depending on your needs, you may simply have a crown (artificial tooth) attached. However, if you have struggled with gum disease or tooth decay and lost many of your teeth, a dental bridge or an implant denture may be used to replace more than one tooth. Bone grafts and sinus lifts are both important procedures that are related to dental implants. Dental implants require a strong, healthy jaw bone. If the jaw is weak due to a chronic condition such as osteoporosis, or the tooth has been missing for years and the jawbone has receded, a bone graft may be required for a dental implant. Bone grafting uses a piece of bone to restore the health of the jaw, and ensure that a dental implant can be placed. Bone can be taken from the patient, or from an animal such as a cow, and grafted into place. Over time, this bone will heal, and provide a natural, strong foundation for a dental implant. Sinus lifts are another related procedure. A sinus lift may be required if there is not enough bone in your upper jaw for an implant to be placed. This surgery “lifts” the sinus membrane, allowing a surgeon to place a bone graft without breaching the membrane and affecting the sinuses. For the most part, any infection risk can be mitigated with good oral hygiene and proper post surgery care. If you brush, floss, and disinfect your implant properly, there is a very low risk of implant failure. However, it is possible for an implant to become infected. Typically, this is due to patients failing to take care of the implant. This is known as “peri implantitis”. It is caused by the bacteria which if left unchecked attack the underlying gum and jaw structure. This infection can be quite serious. It may cause total implant failure. And, like gum disease and tooth decay, peri implantitis can also cause damage to the jaw bone and gums. Minor cases of peri implantitis can often be treated with antibiotics, as well as deep teeth cleanings. Typically, these are resolved in several weeks, and the dental implant can recover, and heal properly. In moderate cases of peri implantitis, the gum tissue is often folded to expose the root of the implant. Then, the implant is cleaned and disinfected , and at the completion of the procedure the gum is sutured back into place. However, severe cases of peri implantitis where the dental implant fails, the implant must be removed, and the area around the implant cleaned. Depending on the extent of the damage, it may or may not be possible to place another dental implant in the future. The majority of patients do not have to worry about peri implantitis. With proper oral care post-procedure, the success rates of dental implants are very high. If the dental implant is incorrectly positioned in the upper jaw, this can lead to a variety of sinus issues and damage. However, this is uncommon, as the dentist should be extremely careful to avoid breaching the barrier between the gumline and the nasal cavity. Still, sinus issues may occur in some dental implants. This usually happens if a patient does not get a bone graft or sinus lift, and has too little bone in their upper jaw. The implant may breach the jaw, causing symptoms such as sinus pressure, sinus infections, and post-nasal drip. Sinus problems can be dealt with using a variety of reconstructive surgical techniques, and are almost never serious enough to be life-threatening, or to cause serious harm. However, they should still be addressed quickly, if a patient suspects a dental implant has breached the sinus cavity. Dental implants can cause nerve and tissue damage, due to the surgical nature of the procedure. If the implant is not placed properly, it could end up damaging surrounding nerves and oral tissue. This can result in pain, or even infection. However, this is quite rare. The symptoms of nerve damage can vary quite a bit. They can include numbness or partial numbness, as well as tingling, burning, or itching sensations near and around the dental implant. Pain and discomfort are not always present, but can be quite intense in some cases. Despite the facts and figures outlined above, dental implants are quite safe, and effective. It has been found that they are highly successful , with very few patients suffering any long term negative side effects. This means that dental implants, despite their reputation as a “scary” oral surgery, are equally as effective as other dental procedures. Because of this, patients who undergo dental implants can be very confident about the procedure. Complications are very rare – and severe complications that require medical treatment are even more uncommon. The vast majority of issues with dental implants are caused by dentists who do not take the time to perform comprehensive, thorough oral examinations. This can lead to improper dental implant technique – which, in turn, can lead to problems such as nerve damage, infections, or sinus breaches. Experienced dental surgeons such as Dr. Bikram Sethi are experts at analyzing the oral health of patients, and determining whether or not they are eligible for implants. If you come in for a consultation at Central Periodontics, Dr. Sethi will give you his honest opinion – and if he thinks that a dental implant is not the right option, he will not recommend it. 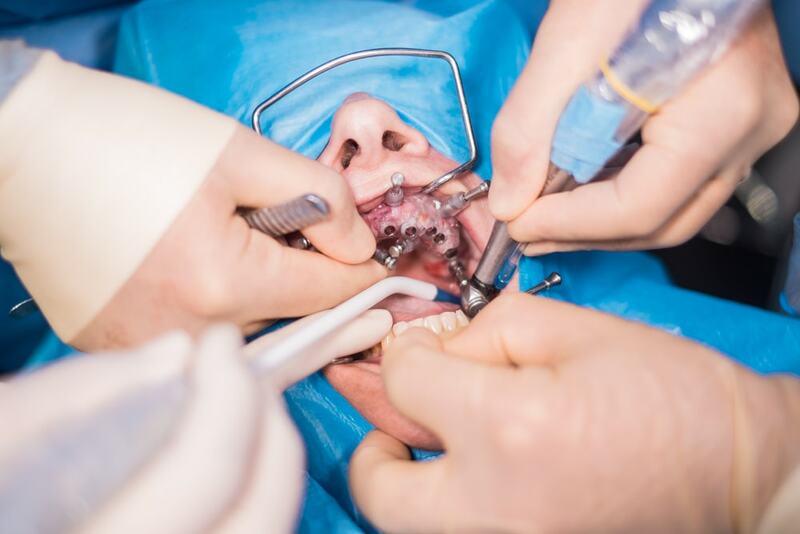 Patients who are at risk of complications include those with poor overall health, a history of gum disease or tooth decay, and elderly individuals who may not be able to have a bone graft. If you fit within one of these categories, a dental implant may carry extra risks. Make sure to discuss these with Dr. Sethi before you undergo any oral surgical procedure. Interested In A Dental Implant? Get A Consultation With Dr. Bikram Sethi Right Away! Dental implants are an ideal long-term treatment for missing teeth. Whether you are looking to replace one or two teeth – or you’ve lost multiple teeth due to gum disease or an impact injury such as a car accident – you can have them replaced at Central Periodontics. So don’t wait. Dental implants can last 30+ years, and provide you with a natural looking and feeling smile which requires no special care. If you’re interested in the benefits of a dental implant, contact Central Periodontics right away. After an examination, Dr. Bikram Sethi will help you understand if you are a good candidate for dental implants, and give you an overview of all of your options for restoring your smile. With a patient-focused and informative approach to oral surgery, he’ll discuss all of the potential complications and risks, and help you decide on the right approach for restoring your smile!